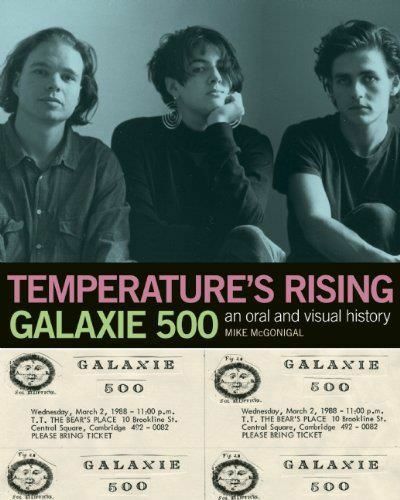 Galaxie 500’s artistic vision, visceral and emotional yet also elegant and understated, extended from their incomparable recordings to bassist Naomi Yang's design aesthetic: album covers, posters, photography. This book offers both an oral history of a celebrated band and a lush tour of their personal archives. It weaves together interviews with the band members (Naomi Yang, Dean Wareham, Damon Krukowski) and their music scene peers and many collaborators, accompanied by a stunning array of rare and never before seen photographs, artwork, and ephemera. There's also a limited edition that includes a 7" single and a ltd. print band portrait by Macioce, signed by the photographer. The 7" features "Temperature's Rising" b/w "Crazy (which was slated to be the band's second single but has never appeared on vinyl before), and is in a limited numbered edition of 275 copies. The 7" is only available via a special limited edition. We'll get that link up on our wonky little website, hopefully by Monday. The limited edition will only be available direct from us. The book itself will have great distribution via PGW to bookshops, and most likely via Mississippi Records distro to record shops. Amazon's pre-order price is pretty good and the books will arrive in their distribution centers at the start of next month so they'll also ship before AMZN's posted release date. TEMPERATURE'S RISING/ CRAZY. One of those songs has never been on vinyl before. It was slated to be the second Galaxie 7" but never got released. Good designer pal of the band's made the artwork for the sleeve. There will also be a color print signed by photographer Mike Macioce. Limited 275 copies of special edition. I'll let you know as soon as I do (well just after - need to make sure I get a copy!!) when and how you can go about ordering it!